Our online certified Business Protection training provides the perfect solution that enables you to train your employees on subjects critical to protect your business and comply with current legislation in a cost efficient and user friendly way. Meticulously created by experts, each course is easy to use, engaging and interactive. There are ten different courses available to choose from which cover all the major areas of Business Protection compliance training. The courses are designed to be fully PC, laptop, tablet and mobile friendly - so your employees can complete them any time and anywhere. At the end of each course is a test which, once passed, allows the delegate to download a personalised certificate, so confirming they have received training. Details of all the Business Protection online courses available for you to buy are presented below - please take the time to look at these. If you have any questions, then do please contact us. 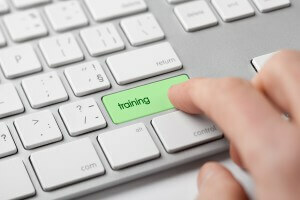 To purchase courses for yourself or your employees, click the Buy Now button. This will take you to our Courses123 website where you can securely place your order and pay for your course(s). To get your 10% discount don't forget to enter the special offer code! The UK Bribery Act 2010 applies to all organisations. It holds all individuals accountable for acts of bribery and corruption, with no excuses. It is therefore essential that everyone in your organisation is familiar with this Act. This online course is an excellent way of ensuring that all your staff and managers have a clear understanding of the legislation and is also a great way of demonstrating that appropriate anti-bribery procedures are in place in your organisation. This course will help to promote those behaviours which protect your organisation’s reputation. It should be taken by all employees, from junior staff to senior management, to help create a collaborative, positive and respectful business environment. Cyber-crime can be catastrophic for a business. A breech in data security can have a large impact on your organisation given how computer reliant we all are today. The actions your staff take can help to prevent cyber-crime. Use this course to show them what to do and what not to do. Suitable for all levels of staff, managers and supervisors. Use this short online course to ensure your managers, supervisors and employees understand the correct procedures for Disciplinary and Grievance. This course is essential for all organisations that want to ensure compliance with the Equality Act 2010 and demonstrate that they value equality and diversity. It is suitable for all full and part-time staff members as well as all managers and supervisors. It will help to promote a culture free of discrimination, harassment, victimisation and bullying. This course will ensure your employees know how to protect your organisation against fraud. It should be taken by all employees, from junior staff to senior management. The General Data Protection Regulations (GDPR) supercede the Data Protection Act. Use this course to ensure all your employees understand the changes and the implications of the GDPR. A "must do" course for everyone involved in handling data and for organisations that want to conform to the GDPR. Abuse of your company’s internet facilities can have serious business and legal consequences. Use this course to ensure every employee with access to the internet is aware of what is considered as reasonable and responsible use of their workplace’s IT facilities and equipment. Slavery did not end in the 19th Century, it still exists in every country around the world despite being illegal everywhere. This course provides is for all employees, whatever their job title. It will arm them with the information needed to identify slavery, guidelines to promote good business practice and details on how to safely report cases of exploitation. Protect your business from money laundering and ensure you are dealing with a legitimate individual and/or organisation by providing this short online course to all your employees. Suitable for all levels of staff and managers. A terrorist attack can happen anywhere at any time. This RoSPA approved Security and Terror Alerts online training course helps your employees to be prepared and know what to do if a security threat occurs. Suitable for all employees, whatever their job title. Do your employees understand their responsibilities and their rights when it comes to raising genuine concerns? This whistleblowing procedures course is suitable for all employees, whatever their job title or the type of organisation they work for.